Politics has always fascinated me. I know this isn’t exactly the case for everyone, but ever since I was little I have been interested in the goings-on around me. I remember being excited to vote for the first time in 2008, just because it meant that I had an official voice - that I was an adult. I’m pretty sure I was more excited to vote than I was to do anything else. The United States makes it so easy for citizens to vote, yet we have such a low voter turnout. According to census data, voter participation among young adults ages 18-24 has been steadily declining in comparison to other age groups since 1964. In 2012, only 38.4% of people 18-24 years olds voted, while 49.5% of those 25-44 voted. This is still not as high as it should be, in my opinion. 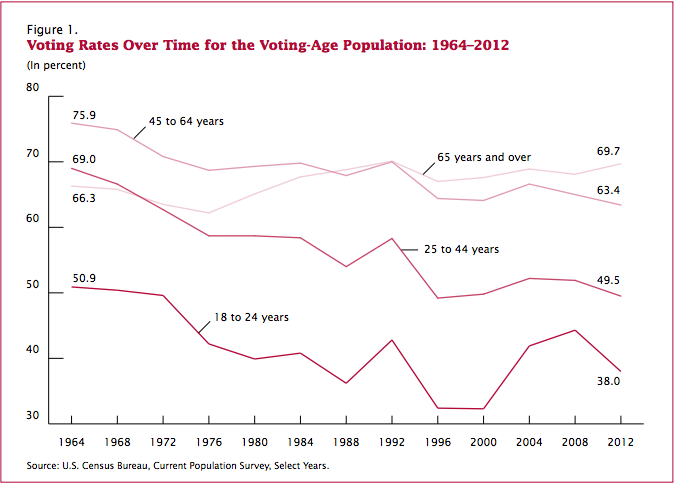 The graph below shows how voter participation by age group has shifted over the years. Voting rates has steadily declined for everyone since 1964 - why? What amazes me about this is the fact that President Obama relied heavily on younger people to win the election in 2008 - you can see the high jump up - and yet it was still such a small turnout in 2012 compared to other age groups. Imagine what politics could look like if young people everywhere eligible to vote participated in the system. That being said, however, I’ve seen how hard it is to talk to people about politics and the importance of voting. I’ve sat at my university to register people to vote and I’ve had students tell me they don’t vote. I’ve had people get so excited that they have the opportunity to vote. I’ve seen people just walk by and ignore me. The vast spectrum of people I see when I table at USM is amazing, yet it saddens me when people state they don’t vote. Last week I traveled to a local high school to talk to a group of 100+ students about the campaign I’m working on. It was heartwarming to see so many students - many of them unable to vote this year because they’re too young - engaged and interested in the political process. So why is it important to be engaged politically? If you want to create sweeping change that affects a large majority of people, it needs to happen through some sort of political action. The best and easiest way for the general individual to get involved is to vote. In Maine, you can register to vote right up until (and during!) Election Day. It’s much harder to register to vote in other states. That being said, there are so many other ways to get more involved with the political process and enact change. You can contact your local, state, or U.S. Representative or Senator. You can testify at hearings or write Letters to the Editor. You can knock on doors and talk to people about different political issues, or run for office yourself. There are countless groups you can work with to create long lasting, political change. The election may be over soon, but political engagement truly should go beyond voting. The election is just one part of being politically engaged. You can go to a hearing at the Statehouse - maybe just to observe the political process in motion or to testify for or against proposed legislation. Our senators and representatives were put into office by the voters, and they have a duty to listen to what the general public has to say about various issues. If going to the statehouse doesn’t interest you, there are town meetings, city council meetings, nonprofit organizations, and more that you can get involved with. Idealist and Volunteer Maine are two great ways to find organizations actively searching for volunteers. What I recommend is to search yourself and find something you are truly passionate about. Organizations that do this type of work are always looking for passionate, involved individuals who want to make a different. Do a simple google search for organizations in your community that are under the umbrella of what you want to work with. If you’re as appalled as I am with the low turnout rates our country currently has for voting - you can help out with some of the Get Out the Vote (GOTV) efforts. The people behind all of the referendum questions are out knocking on doors talking to voters this coming weekend, as are the party officials. If that doesn’t interest you, please make sure you have your voice heard and vote!